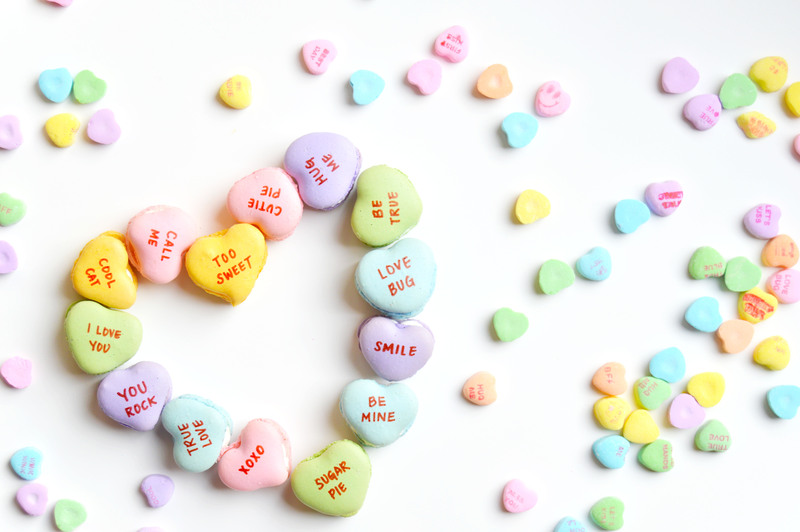 I learned how stubborn I could be when I went to buy a bag of conversation hearts this past week. 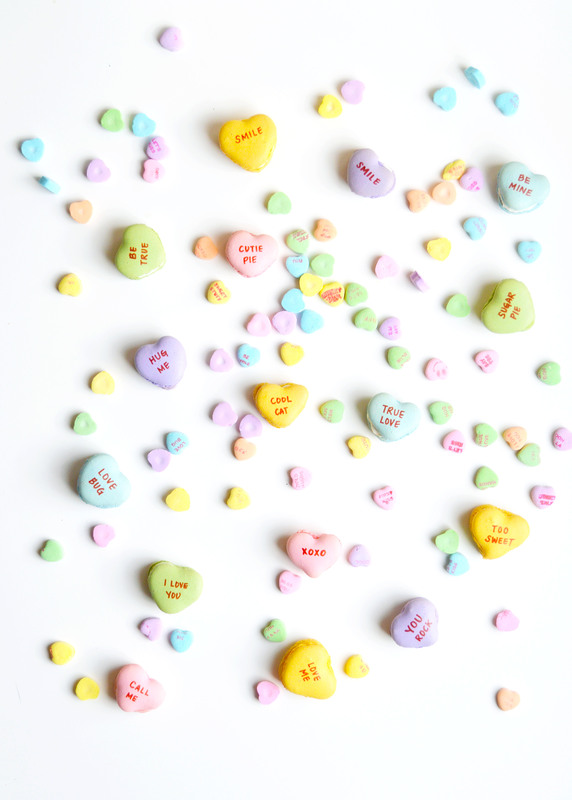 I was so convinced that the original conversation hearts were made by Brach’s, I stood in the candy aisle for 5 minutes debating whether Brach’s or Necco made the original conversation hearts with my sister. I guess the average person would’ve pulled out their phone right away and searched Google, but I felt like I was pretty darn sure I was right. Turns out I was wrong. It was originally made by Necco. I was basing my fact on the memory of the boxes of conversation hearts I received during Valentine’s Day in elementary school. Many of my teachers would set up a big box for students to put in Valentine’s Day cards and hand them out on the big day. Some kids would bring a bag full of identical valentines to give out to everyone so no one felt left out. Some kids of course, received more valentines than others, but the usual stash would be a lip or heart shaped lollipop, Hershey’s kisses, and small boxes of conversation hearts. 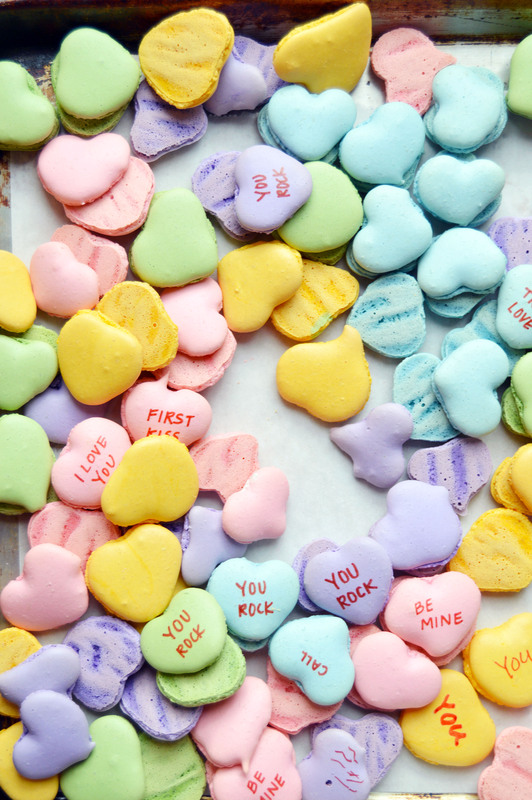 I never really liked the conversation hearts because (if memory serves me right) they tasted like chalk. 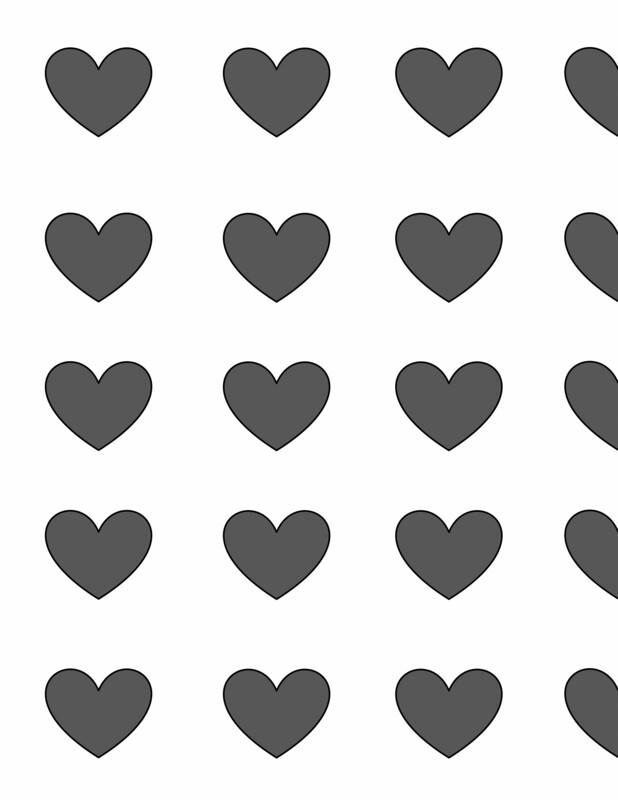 But if I ever received a box from a crush I would read each heart wishing that it was a heartfelt message from them. SMH Boy crazy from such a young age I tell ya. So I took a page from my childhood memory and turned them into macarons. I’ll tell you straight off the bat that these macarons are a labor of love. 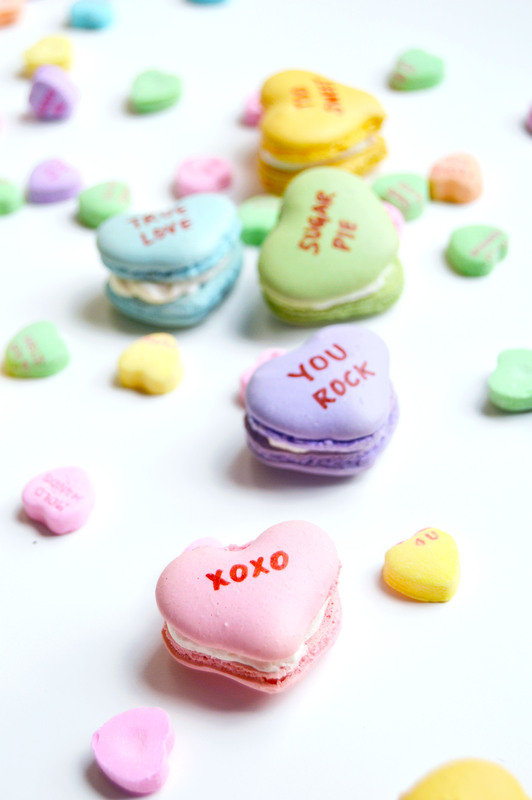 Perhaps it’s because my macarons are made with an Italian meringue or because I just plain stink at it, piping macaron batter into a heart shape is not easy. The batter wants to cling onto your piping tip and ruin the pointed ends that you want to achieve. Also, dividing the batter into 5 colors and changing the piping bag and washing the piping tip 5 times is tedious. And if you only have one spatula? You would have to clean that spatula every time you mix a different color for the batter and you would be dirtying 5 different bowls. This is FIVE times the work required people! The frosting on the other hand is my favorite vanilla frosting flavored with Elderflower concentrate. If you’ve ever been to Ikea, you may have seen the boxed juices that they sell. Elderflower has a mild floral and tart flavor. Why did I add the elderflower concentrate? Because in my mind, flowers = romance = Valentine’s Day. 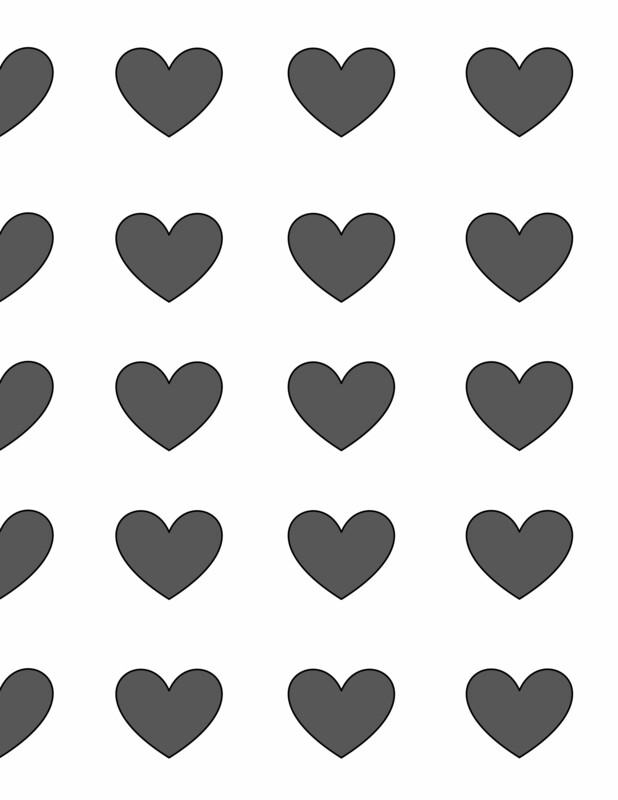 Line two baking sheets with heart template left and right and parchment paper or silicone mats. In the bowl of a food processor, add the almond meal and powdered sugar and pulse until thoroughly combined. Divide the almond mixture into 5 different bowls. Each fifth of the batter should weight 101g. 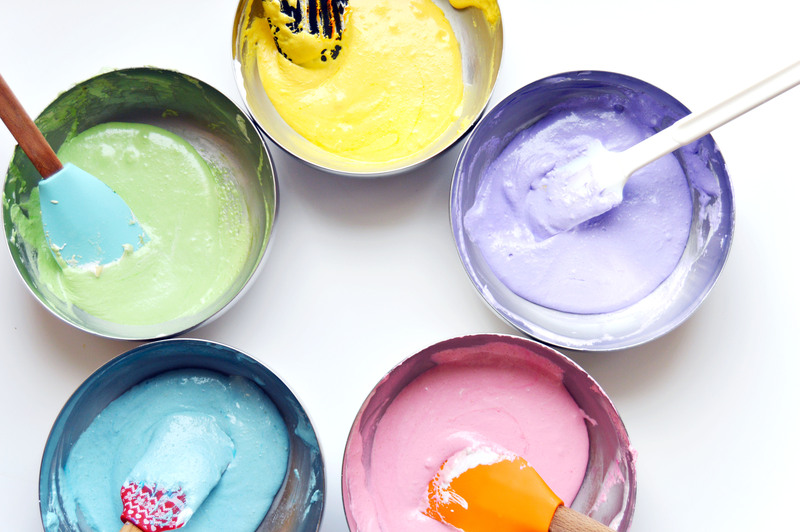 Color each almond mixture with pink, yellow, green, purple and blue gel food coloring. Set aside. Once the syrup reaches 248 ˚F, remove the pot off the burner and slowly pour the syrup down the side of the mixing bowl with the egg whites on medium speed. Once the egg whites are fully incorporated, increase the speed to medium high until egg whites form glossy, stiff peaks. Place one fifth of the egg mixture into each bowl of the colored almond mixture. Fold the egg white mixture into the almond mixture until the mixture “flows like magma”. The mixture should be smooth and run thick ribbons off the spatula. With a pastry bag fitted with a ½ in. plain tip, fill the piping bag with the pink macaron batter. Pipe one side of the heart, releasing pressure as you get to the pointy tip and repeat with the other side of the heart. The piped batter may have peaks but should smooth away in a minute or two. Every time you change the batter color, remember to clean the piping tip and use a new bag. Let the batter stand until the tops of the macarons are dry to the touch, about 30 minutes to 1 hour. Preheat the oven to 325-350˚F. If your oven tends to run hot go for 325˚F, if not then 350˚F. Bake 8-10 minutes, until the feet are formed and the tops are smooth. The macaron shell is done when you slightly wiggle it and it starts to come off of the parchment paper / silicone mat. Remove pan from oven and reheat oven to higher temperature for 10 minutes before baking the next tray, lowering the temperature when you start baking it. 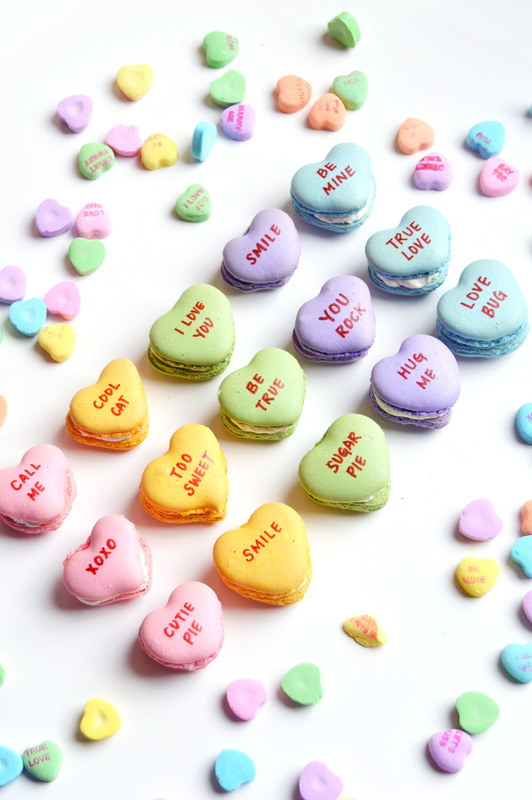 Continue until you bake all of the macaron shells. Once the macarons have cooled, pair each macaron shell to one of a similar size. 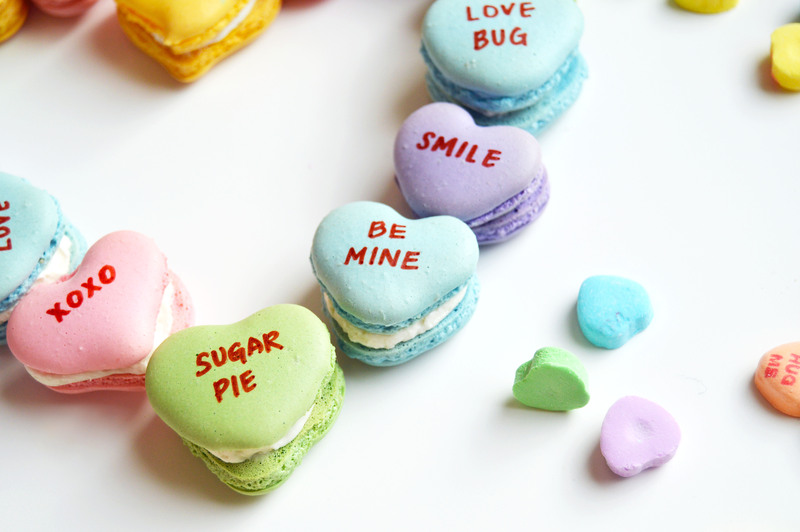 Use the red food coloring pen to write out messages on one side of the macaron. Let dry and sandwich each macaron with vanilla elderflower frosting. In a small pot over medium heat, whisk milk, salt and flour until combined. Place a piece of plastic wrap on top of the flour mixture (to prevent skin from forming) and put bowl into the fridge until fully cool. Add vanilla extract and 4 tbsp. of elderflower concentrate. Taste and if you want a stronger flavor, add another 2 tbsp. of elderflower concentrate. 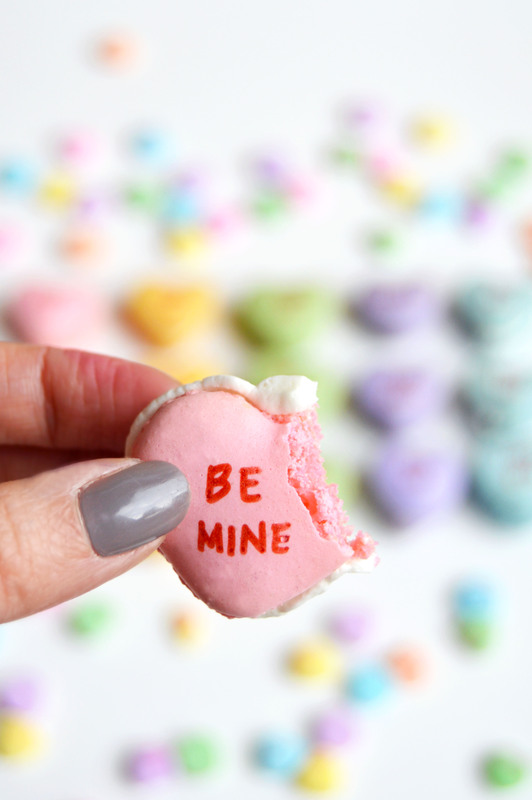 This entry was posted in Cookies, Desserts, Floral, Holidays, Macarons, Vanilla and tagged candy, conversation hearts, Cookies, elderflower, love, Macarons, valentines day, vanilla. Bookmark the permalink. Wow those look amazing! So much work, but I’m sure it was totally worthwhile 🙂 The elderflower icing sounds delish too! Cute idea! That Elderflower icing sounds incredible! Thank you! It means a lot coming from the queen of DIY macarons!